Skip the wait! With mySASKTEL you can manage your services online anytime, anywhere. For help, see the mySASKTEL support hub. Data charges may apply when using a wireless network. Check the wireless terms of service with your provider. 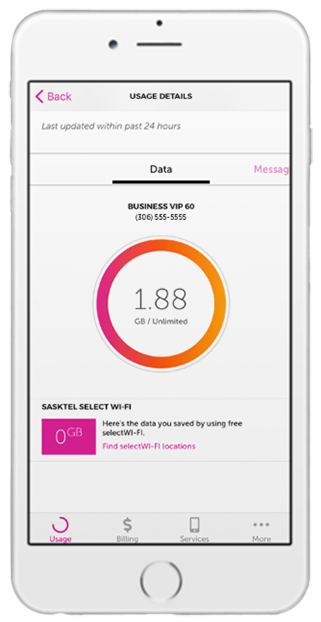 SaskTel wireless customers can use the mySASKTEL app or see sasktel.com/myusage for data usage. 1Some Internet speed upgrades require a booked appointment with a SaskTel Technician. Customers will receive a quote number online and can chat or call a SaskTel Representative to book the appointment. 2Available in the app only.